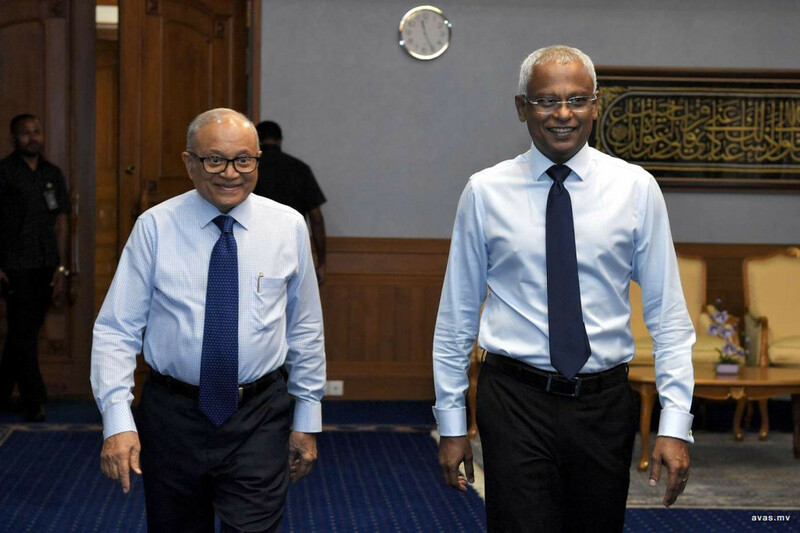 Former President Maumoon Abdul Gayyom has expressed displeasure in coalition partner and current President of the Maldives Ibrahim Mohamed Solih. Speaking at a meeting held with the candidates fielded for the parliamentary election by the ex-president's Maumoon Reform Movement (MRM), Maumoon recalled the President's promise to return Progressive Party of Maldives (PPM) to it's rightful owners, and rebuked the President for not fulfilling his promise. "During the last [presidential election], our candidate Ibrahim Mohamed Solih promised he would return PPM back to its rightful owners. While the pledge still remains unfulfilled, my wish is for the promise to be fulfilled without delay", said Maumoon. PPM held a congress in 2013 to elect former president Maumoon Abdul Gayoom as the party president. Gayoom however was unceremoniously ousted from the party after falling-out with his half brother, then-president Yameen Abdul Gayyoom. The Civil Court in 2016 found Gayoom guilty of violating the constitution, party charter and the political party law and handed-over party control to president Yameen. Although the verdict was appealed by Maumoon, the court ruled against him. After President Yameen's humiliating defeat in the 2018 presidential election, a congress was hastily held by PPM , electing Yameen as the new party leader. Maumoon then challenged the validity of the congress at the court, after which the Supreme Court of Maldives issued the verdict supporting the High Court verdict declaring the congress held by PPM following the 2018 presidential election as valid, recognizing Yameen as the leader of the party. It was after this that Maumoon moved to establish a new political party named Maldives Reform Movement (MRM). Although MRM is not yet a registered politic party, the movement fielded candidates for the parliamentary election, out of which only one candidate was able to secure a parliament seat. Addressing at Tuesday's meeting, President Maumoon said MRM cannot afford to sit back in sorrow, and emphasize that the establishment of the new party has to be hastened. The party has been attempting to sign up the required 3000 members to register the party, however, they have been unsuccessful thus far. Maumoon urged the campaign teams of the MRM candidates to assist in signing up 3000 members for the party, and stressed that one cannot give up and remain inactive when a challenge is faced in the political field. Failures and defeats have to be forgotten, and the future must be faced with renewed determination and hope, said Maumoon.